With its central location, Schlosshotel Zamek Zdikov is within easy reach of most tourist attractions and business addresses in Zdikov. 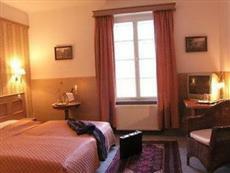 The Schlosshotel Zamek Zdikov boasts a convenient location with modern amenities in every guestroom and superb service. The guestrooms are equipped with non smoking rooms, bathrobes, desk, in room safe, television, bathtub, shower, satellite/cable TV.The basic amenities provided at this Zdikov accommodation comprise bar/pub, meeting facilities, restaurant, room service, safety deposit boxes, disabled facilities, business center, pets allowed. For a more enjoyable stay, guests can take advantage of a variety of recreational facilities, including massage, indoor pool, sauna, garden. Modern comfort and convenience are seamlessly combined to ensure the guests' satisfaction. To proceed with this reservation at the Schlosshotel Zamek Zdikov, please enter your visit dates and follow our secure online booking form.